A founder of the domestic workers movement in South Africa recounts the struggle for labour protections and rights that began in the time of apartheid. 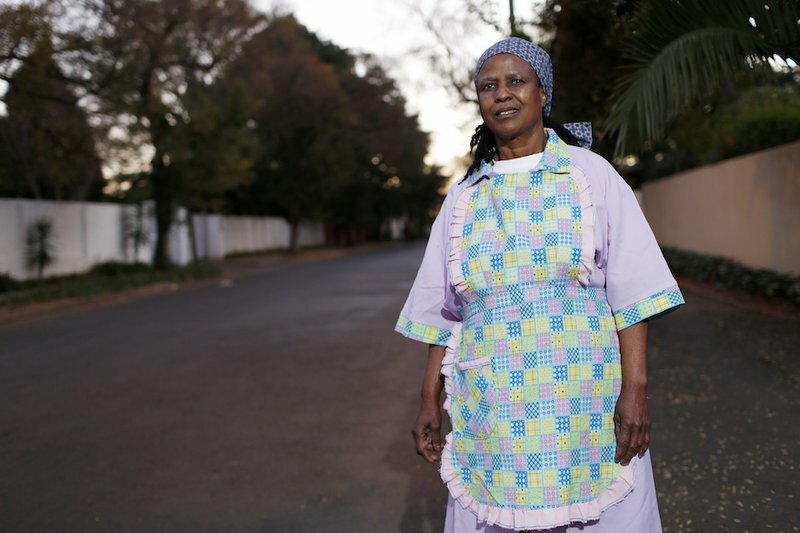 A domestic workers in Johannesburg, South Africa. Solidarity Center/Jemal Countess/Flickr. Creative Commons. So the question is, how did I come from my humble beginnings to where I am now? My life in this field started in 1966, when I became a domestic worker. I was working for a family, in 1967, and I remember I was pregnant and had a baby that same year. I also remember that, during the apartheid times, there was an article in the newspaper about how some employers didn't allow the friends of domestic workers to visit the property. The question that a came to my mind was what are we? And why are there no rights for us? So I questioned the situation. I wrote a letter and I sent it to the newspaper without thinking. I just wrote my frustration: why are we different? Why are there no laws to protect us? Why are we not seen as people? And then, three days later, a reporter from the newspaper came to the door and was looking for the maid, the servant. This reporter decided that I educated and asked me why I kept my ideas to myself, instead of speaking out. I became a spokesperson for both sides, and that is where I discovered a certain talent I have: I have the ability to speak. So we called a meeting in 1968, here in Salt River (Capetown, South Africa), in a big hall for garment workers. At that time, we still had the apartheid system that coloureds, blacks, and whites were separated. The reporter put an article in the newspaper inviting domestic workers At that meeting, I discovered something about myself. There were about 250 domestic workers present and the reporter prepared a long speech for me. But when I went to the front, I realised that, no, the reporter's speech was not what I wanted to say. When I saw the domestic workers in front just like me, I just opened by saying, “Good evening, I am a domestic worker just like you”, and broke the ice. And what happened there became history. The domestic workers finally started talking about what had happened to them, how they were exploited, and a lot of things came out to the surface. A few days later, the same reporter came back and said, “Oh, they are electing you as a chairperson”. I didn’t even know what a chairperson was, but he said, “you must speak and represent domestic workers”. My employer decided that she didn’t want to lose me, and that she was going to allow me to use the garage for Sunday afternoon meetings – the only free time we had – and the telephone during the two hours a day I was normally resting, since I was in the newspapers and was even receiving phone calls from some employers. They wanted to ask advice about their workers, and sometimes requested that I come and try to solve the problem between them. I became a spokesperson for both sides, and that is where I discovered a certain talent I have: I have the ability to speak. I have the ability to share with others who listen to me and that makes me feel so good. I was seeing this manifest when I interacted with others, and I realised that I enjoy speaking about the concrete issues faced by domestic workers. It was the law of the country that no domestic worker could have their family with them. I started meeting with other domestic workers, other pioneers of the domestic workers’ struggle. Together we started going into churches and onto the streets to speak with other domestic workers, during a time of apartheid. I got married but I was not allowed to stay with my children, as the Group Area Act separated us by colour. My eldest daughter was only a month old and she had to stay with my mother. My husband was kicked out in the middle of the night, and my employer could not do anything as it was the law of the country that no domestic worker could have their family with them. This all became too much for my employer and me, so I went to work in a factory as a shop steward, but I never forgot about the domestic workers. In 1982, my employer closed the factory and he actually said to me, “you need to go and find out what is happening to those domestic workers you left behind”. So I went to look in a phone book and I saw a domestic workers association listed, and I asked myself if this was an organisation. I remember that Friday I went into town, as I walked into that room, and the women said, “Myrtle, we can’t believe this. We were looking for you all of this time.” “Your place is here,” they said. What shocked me was that when I went to the meeting, it was the very same domestic workers that use to meet with me in the garage. They told me to address domestic workers’ problems and to become a part of this struggle. In 1985 organisations worked together to form the Congress of South African Trade Unions (COSATU), and one year later we launched the South African Domestic Workers Union as one of its affiliates. I had been part of the fundraising team and was asked to be the national treasurer. At the same time, I kept fighting for labour laws. We had no labour laws, there was absolutely no laws to protect and no rights for domestic workers. We were earning only 110 rand per month, which was at the time was only worth about 10 dollars, even though we worked from Monday to Monday. In 1988 we went to sit on the steps of the former labour department, waiting for the former minister of labour to come out and speak to us. At that stage, domestic workers only paid 25 cents per month to be in their union. We kept going and we had protests. In 1986, when they banned all organisations, they didn’t really come after us. We kept fighting. In 1994, when we got freedom, we asked why so many necessary labour laws remained either non-existent or unimplemented. The discrimination is still there, especially among women. We are trying to break those barriers down. Domestic workers still don’t have houses, they are isolated from their children, and some stay in houses without proper toilets. They earn too little to have a banking account or to buy their own homes and yes, we might be a bit better off because we have some labour laws, but do these laws play a big role in domestic workers lives? Not really. The discrimination is still there, especially among women. While we had achieved some laws in South Africa, we needed international rights for domestic workers. That’s where we began to work towards ILO Convention 189, the 'Domestic Workers Convention'. We found that South Africa was leading in terms of labour laws and that many of the items that were discussed at the ILO had already been addressed in South Africa. South Africa was there from the beginning, when we began discussing the global rights of domestic workers. In 2006, under the auspices of the Netherlands Trade Union Confederation (FNV), we held a domestic workers conference to discuss how to go forward and fight for global rights for domestic workers. Two years later we set up a committee to fight for international domestic workers rights. I was chair that committee with 10 other members from different countries. We formed that committee not knowing where it would lead, but in 2009 we were given a chance to go to the ILO. There I spoke on behalf of both my government and the international domestic workers network. It was the first time domestic workers could speak out, and I was so proud to be a former domestic worker and to lead this delegation. There, we learned about the different ways we were discriminated against globally. We found out that we shared experiences of being degraded by our employers. We also learned that some of the governments were clamping down on workers, saying that we are only poor women and thus underserving of rights. It reminded me of our former discrimination in South Africa. Sexism was there. But we proved them wrong. We showed the power of domestic workers when we stand together. We were so great that we even defied them by throwing a banner at the ILO down, which we were not allowed to do, when we achieved the convention on domestic work in June 2011. Again I was so proud to speak. It shows you the power that we have. But now we are asking, how do these international labour laws actually help us? And we find that there is still a lot of discrimination. There are still a lot of countries that don’t have decent rights for domestic workers. If a domestic worker does not have freedom, how could she possibly enjoy these rights? We launched an International Domestic Workers Federation in 2013 because, even though we had national and international labour laws, we still needed a mechanism to ensure that the voices of workers were heard and to uplift these voices, which is a big role. And then, again, history was made. This federation was for women, and led by women. Again, I was fortunate to be chosen to be the president. In the past few years, I have really enjoyed leading this federation towards gaining rights for workers in the world. We started out as 255,000 members and 30 organisations, and today we have over 500,000 members and 62 organisations. At the beginning everybody was watching us, saying we were women and won't be able to lead, and step by step we have proved them wrong. In five years time, we want to reach 200,000 migrant workers and double the number of domestic workers. In COSATU, we have this saying, “an injury to one is an injury to all”. We have seen this at the national level and now we are fighting to assure that every domestic worker around the world can gain dignity through decent work. If anyone had told me 50 years ago that I would be here today, after having become a domestic worker as well as a single mother of three children in 1982, I would not have believed them. Today I am a proud leader, a mother of three and now also a grandmother of three. I will continue fighting for domestic workers rights every day of my life, as I remember those early days that led me to this particular struggle, that has now made its place in world history. But the struggle remains to fight for justice and decent rights for domestic workers.